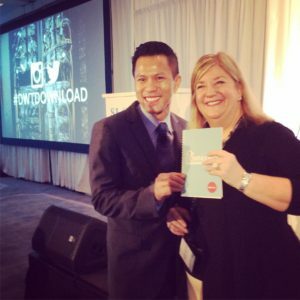 After three successful years running the DOWNLOAD digital tech conference in New York, Jimmy Nguyen helped bring DOWNLOAD to LA for the first time in January 2016. This digital tech conference is run by Davis Wright Tremaine LLP (Jimmy’s former law firm). Jimmy hosted the event and also delivered a keynote presentation entitled “Digital DNA: A Key to Business Transformation” – about how companies must integrate digital technology and mindsets into the very DNA of their organizations. Other session topics included social media marketing, big data, cybersecurity, and wearable technology. Jimmy co-founded the DOWNLOAD event in 2013, along with Allie Nicholson, Chair of DWT’s Communications, Media & IP practice group. It has quickly grown in popularity with in-house attorneys and business executives at many leading companies.